The State of Arizona is noted for its desert climate, mild winters and warm summers. However, these conditions vary based on which part of the state you are in. The State of Arizona is the 6th largest of the 50 states. That means the topography is very different throughout the state. The variation in climate and scenery provide residence an abundance of choices when choosing a place to live in the State Of Arizona. Living in Arizona also has many lifestyle choices. The urban setting of Phoenix and Tucson or the more rugged conditions in Flagstaff. The northern areas of Arizona provide mild summer temperatures, but colder winters. Flagstaff gets lots of snow every winter. Douglas fir and spruce trees populate the landscapes in northern Arizona. Large canyons – The Grand Canyon – create some of the most dramatic scenes in the great southwest. The famous Petrified Forest National Park is in northern Arizona. The southern area of the State of Arizona sits in the vast Sonoran Desert. Winters are very mild. But summer temperature will be over 100 degrees. However, due to the low humidity, these temperatures are very tolerable. Interestingly, Mt. Lemmon, just an hour from Tucson, sits at 9,200 feet. Mt. Lemmon is the southernmost ski resort in the continental United States. In addition to answering the question “where to retire“, here is more information on the State of Arizona. Arizona Counties Top Rank In U. S.
Arizona’s official state neck wear is the bola tie. Unlike the rest of the country except Hawaii, Arizona does not recognize daylight savings time. This means that it is the same time as Mountain Time in the winter in line with Pacific Time in the summer. The Navajo Nation, however, does follow daylight savings. The Grand Canyon is 277 miles long and up to 18 miles wide in some places. The Morenci Mine is the largest copper mine in the whole of North America. When England’s famous London Bridge was replaced in the 1960s, the original was dismantled and moved to Lake Havasu City, where still it stands today. Arizona has more designated Native American land by percentage than any other state. 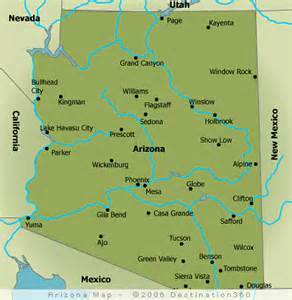 Admitted into the nation in 1912, Arizona was the last to become a state in the continental U.S. When the famous O.K. Corral shootout in Tombstone occurred, Wyatt Earp was only a temporary deputy, not the town sheriff or marshal. The State of Arizona and it many Arizona attractions make it a place to visit and a wonderful place to live or retire too. If you think the State Of Arizona might just be the place for you, we hope this information has been helpful. If you are thinking about a home in Tucson AZ, let us help you. Interested in daily email updates on homes for sale in Tucson AZ MLS?